Diarrhea is the second most common cause of morbidity and mortality among children under 5 years old worldwide, following acute respiratory tract infection. Globally, there are nearly 1.7 billion cases of diarrheal disease and 760,000 deaths in children under 5 every year. In India, diarrhea accounts for nearly 212,000 under five deaths annually. On an average, children below 3 years of age in India, experience about 3–5 episodes of diarrhea every year. In addition to the risk of mortality, persistently high rates of diarrhea among young children can be associated with malnutrition, micronutrient deficiencies, and significant deficits in psychomotor and cognitive development. Most of the mortalities and morbidities due to diarrhea can be prevented by practicing primary preventive measures such as the use of clean water, handwashing, exclusive breastfeeding, immunization, sanitary disposal of excreta, use of latrines, and good sanitary and hygienic practices. Secondary measures include early recognition of dehydration due to diarrhea and prompt oral rehydration, increased and continued feeding of energy-rich foods in addition to breastfeeding, and zinc therapy. Timely and appropriate management at household and in health services remains an important intervention for reducing mortality and morbidity due to childhood diarrhea. However, poor socioeconomic status, lack of knowledge among caregivers, and failure to provide therapy when needed are hindering factors in preventing diarrheal deaths. With reference to the pivotal role mothers play in management of diarrhea, a joint statement of WHO/UNICEF stressed the need to understand their present knowledge, attitude and practices regarding diarrhea. Mangaluru is unique with high literacy rate, better health indices, and health-care facilities. In this context, the present study was taken up to determine the knowledge, attitude, and practice of mothers of under-five children regarding the diarrheal illness. This hospital-based, cross-sectional study was conducted in a Medical College Hospital in Mangaluru, from July to September 2017. The target sample size for this study was estimated at 100 mothers with children between 6 months and 5-year age group. They were approached when they attended hospital for treatment of their children either as outpatient or inpatient. All enrolled mothers were given prestructured questionnaire. The questionnaire contained sections on sociodemographic data, questions on knowledge, attitude, and practice regarding management and prevention of diarrhea. The questionnaire was prepared based on available literature and validated by a senior pediatrician. The information collected was tabulated and analyzed using frequency, percentage, and Chi-square test. In our study, out of 100 mothers, 40% of mothers were in the age group of 21–25 years and 31% of them were in the age group of 26–30 years. All of them were literate with 47% of mothers completed high-school education and 37% of mothers completed PUC education. 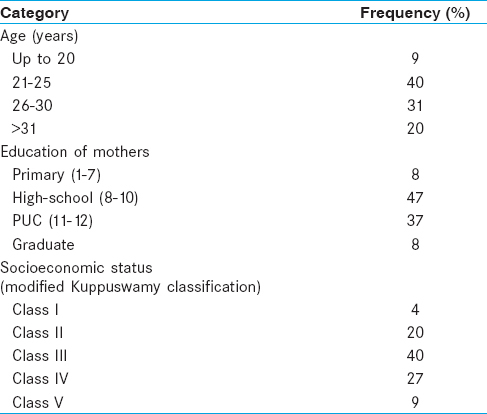 Majority of mothers (40%) belonged to Class III socioeconomic status and 27% belonged to Class IV socioeconomic status [Table 1]. There were ten questions in the questionnaire to assess knowledge. Each correct response was given a point of 1 and wrong response was given 0 point. A score of ≤5 and >5 was considered as having poor and good knowledge, respectively. The answering pattern showed [Table 2] that no single question was consistently found difficult. Difficulty was analyzed on the basis of their ability to understand and answer a particular question without any problem. Question No 1, 2, 3, 6, 8, and 9 were rightly answered by more than 50% of participants. Mothers with good knowledge regarding diarrheal symptoms were 84%, regarding spread were 72%, and regarding prevention about diarrheal illness were 68%. Mothers who belonged to more than 25 years of age group were 51%, 45% of mothers who had college education, and 57% of mothers who belonged to higher socioeconomic status had good knowledge [Table 3]. Attitude about diarrheal illness was regarded as casual or serious based on their approach toward diarrhea by asking three questions. Mothers who had serious attitude toward diarrheal illness were 71%. In mothers who were in the age group of <25 years, 42% mothers and 40% of mothers who had completed school education and 56% of mothers who belonged to higher socioeconomic status had serious attitude regarding diarrhea [Table 4]. 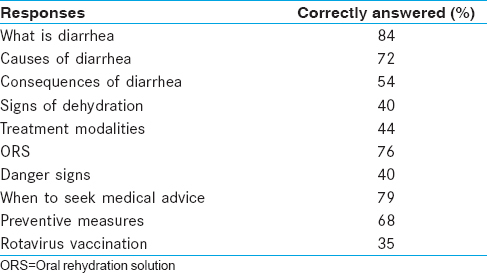 Practices regarding diarrheal illness were considered as good or poor by asking three questions. Majority of mothers practiced exclusive breastfeeding for the first 6 months. More than half (52%) of mothers continued breastfeeding during diarrheal episodes. However, 42% of mothers had bottle-fed their babies without realizing that bottle-feeding practice is one of the main causes of diarrhea [Table 5]. Mothers who vaccinated their children with rotavirus vaccine (35%), most of them belonged to higher socio-economic status with completed college education [Table 5]. Out of 76% of mothers who practiced good dietary and preventive measures during diarrheal episodes, 40% of mothers were under 25-year age group, 42% had completed college education, and 60% belonged to higher socioeconomic status [Table 6]. Statistically significant association was observed between age group and knowledge regarding diarrhea (P ≤ 0.0001) and attitude of mothers regarding diarrhea (P = 0.04), whereas no significant association was observed between age group and practices regarding diarrhea (P = 0.19). Statistically significant association was observed between education status and knowledge (P ≤ 0.0001) and practices regarding diarrhea (P = 0.0002), whereas no significant association was observed between education status and attitude regarding diarrhea (P = 0.26). Statistically significant association was observed between socioeconomic status and attitude (P = 0.0008) and practices regarding diarrhea (P ≤ 0.0001), whereas no significant association was observed between socioeconomic status and knowledge regarding diarrhea (P = 0.06) [Table 6]. A strong association was found between age group, educational status, and socioeconomic status and knowledge, attitude, and practices regarding diarrheal illness. Our study showed that majority of mothers (84%) had good knowledge about symptoms of diarrheal illness. In other studies by Rokkappanavar et al. and Chaudhary et al., similar results were observed with 80% and 93% of mothers had a fair understanding of diarrheal disease, respectively. Most of the mothers (72%) had good knowledge regarding the causes of diarrhea in our study. Similar results were observed in other studies by Khalili et al. and Cabatabat with 81% and 77% mothers, respectively, having fair knowledge about the causes of diarrhea. In studies by Rokkappanavar et al. and Kapoor and Rajput, most of the mothers were ignorant about the causes of diarrhea. This difference may probably because their studies were conducted in urban slum areas with low literacy rate whereas our study was conducted in a city with high literacy rate. In our study, most of the mothers (40%) had limited knowledge regarding signs of dehydration and danger signs. These results were similar to other studies by Jain and Khan and Saunders. Knowledge regarding the type of diet to be followed at home during diarrheal episodes was good in our study and also knowledge about oral rehydration solution (ORS) was good. In a study done by Saurabh et al., the knowledge regarding diet and ORS was poor. The difference in results may probably because their study was done in area with low literacy rate whereas our study was done in a city with high literacy rate. Our study also found a healthy attitude and practice of exclusive breastfeeding for the first 6 months and continued breastfeeding during diarrheal illness by majority of mothers (52%). Similar observations were by Ranjan and Paswan in their study. Our study showed that majority of mothers regarded diarrhea as serious illness. Many of the mothers in our study were able to take care of the episodes of diarrhea by the following household remedies along with ORS. Medical advice was sought immediately, if no improvement was observed after initiating home oral rehydration therapy. In a study by Chaudhary et al., in urban slum of Delhi, where medical advice was not sought immediately. The difference in results may be due to our study was conducted in Mangaluru, which has high literacy rate, better health indices, and health-care facilities. However, in our study, it was observed that majority (42%) of the mothers practiced bottle feeding with less knowledge regarding their cleaning techniques. Mothers have not vaccinated their children with rotavirus vaccine (65%) because of poor knowledge, higher cost, and no government supply of vaccine. However, those mothers (35%) with higher education and socioeconomic status had vaccinated their children with rotavirus vaccine. Maternal education in particular health education should be used as an effective tool to promote knowledge and good practice regarding diarrheal illness in children under 5 years of age. Inclusion of rotavirus vaccine in national immunization schedule will help in improving its coverage. World Health Organization. The Treatment of Diarrhea: A Manual for Physicians and Other Senior Health Workers. 4th rev. Geneva: World Health Organization; 2005. p. 3.
WHO Media Centre. Diarrhoeal Disease. Fact Sheet N0 330; April, 2013. Available from: http://www.who.int/medicentre/factsheets/fs330/en/. [Last accessed on 2013 Aug 25]. Bhutta ZA. Acute Gasroenteritis in Children. Nelson Text Book of Pediatrics. 20th ed. Philadelphia: Elsevier; 2016. p. 1854-74. Shah D, Choudhury P, Gupta P, Mathew JL, Gera T, Gogia S, et al. Promoting appropriate management of diarrhea: A systematic review of literature for advocacy and action: UNICEF-PHFI series on newborn and child health, India. Indian Pediatr 2012;49:627-49. Sarkar R, Gladstone BP, Warier JP, Sharma SL, Raman U, Muliyil J, et al. Rotavirus and other diarrheal disease in a birth cohort from Southern Indian community. Indian Pediatr 2016;53:583-8. World Health Organization. The Management of Diarrhoea and use of Oral Rehydration Therapy: A Joint WHO/UNICEF Statement. 2nd ed. World Health Organization; 1985. Available from: http://www.hetv.org/pdf/management-ort.pdf. [Last accessed on 2013 Aug 16]. Ogbo FA, Agho K, Ogeleka P, Woolfenden S, Page A, Eastwood J, et al. Infant feeding practices and diarrhoea in sub-Saharan African countries with high diarrhoea mortality. PLoS One 2017;12:e0171792. Rokkappanavar K, Nigudgi SR, Ghooli S. A study on knowledge and practice of mothers of under- five children regarding management of diarrhoea in urban field practice area of MRMC, Kalburgi, Karnataka, India. Int J Community Med Public Health 2016;3;705. Chaudhary P, Basu S, Dzeyie KA, Gulla S, Khade S, Patel A, et al. Knowledge, attitude and practice of mothers regarding diarrhoeal illness in children under five years of age: A cross sectional study in an urban slum of Delhi, India. J Community Dis 2014;46:13-21. Khalili M, Mirshahi M, Zarghami A, Rajabania MC, Farahamand F. Maternal knowledge and practice regarding childhood diarrhea and diet in Zahedan, Iran. HealthScope 2013;2:19-24. Cabatabat AM. The effect of health education on the KAP on the mothers on diarrhoea in Barangay. Zamboanga Medical School Foundation; 1999. Available from: http://www.som.adzu.edu.ph/research/pdf/2008-05-09-100350 cabtatbat.pdf. [Last accessed on 2013 Aug 16]. Kapoor P, Rajput VJ. Maternal knowledge, attitudes and practices in diarrhoea. Indian Pediatrics 1993;30:85-7. Jain SK, Khan JA. Epidemiological study of acute diarrhoeal disease and acute respiratory infection amongst under five children in Alwar district, Rajasthan, India. Indian J Pract Doct 2006;3. Available at: ttp://www.indmedica.com/journals.php?journalid=3&issueid=91&articleid=1274&action=article. [Last accessed on 2013 Aug 14]. Saunders N. Maternal Knowledge, Attitudes and Practices Concerning Child Health among Mother of Children Younger than 60 Months in Kep district, Kingdom of Cambodia; 2005. Available from: http://www.wiki.straightjacketstudio.com/images/6/63/CIH2005-6-NSaunders-ChildHealthKAP.pdf. [Last accessed on 2013 Aug 16]. 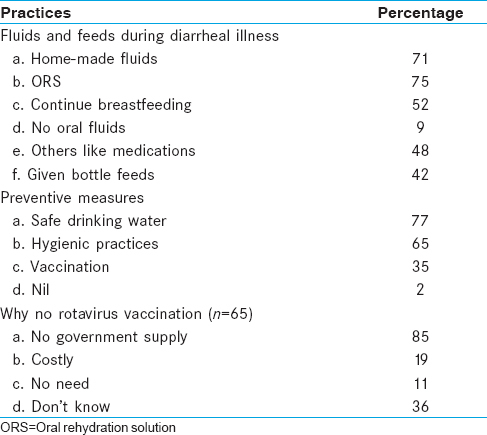 Saurabh S, Shidam UG, Sinnakirouchenan M, Subair M, Hou LG, Roy G. Knowledge and practice regarding oral rehydration therapy for acute diarrhoea among mothers of undr-five children in an urban area of Puducherry, India. Natl J Community Med 2014;5:100-4. Ranjan R, Paswan B. Child morbidity and breast feeding status in India. Available from: http://www.epc2006.princeton.edu/papers/60241. [Last accessed on 2013 Aug 14].